Sometimes the best workout ideas come from people we meet at the Y! 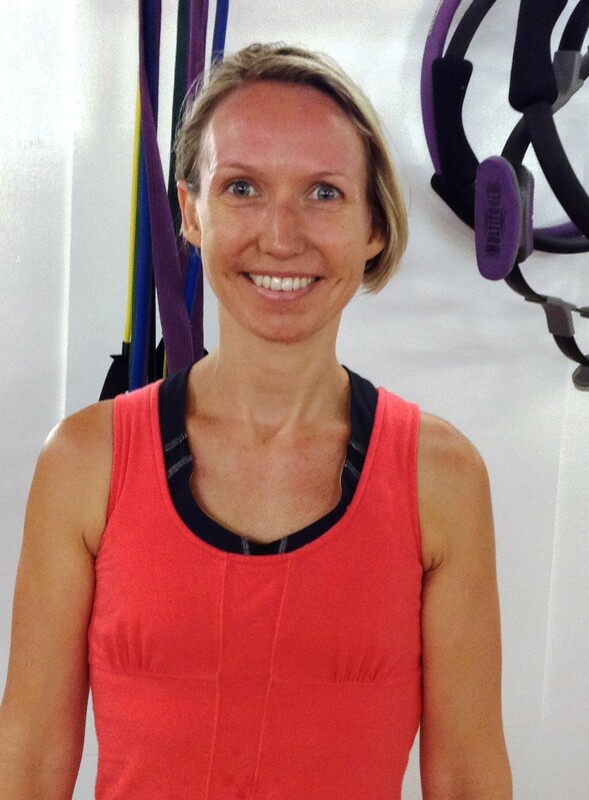 Lisa, a mom of two needs quick, intense workouts for her body and her mind. Try it and let us know what you think! Each year, about 800 theater pieces from around the world apply for the New York International Fringe Festival (FringeNYC). When Julia Miller applied with her Chicago based company Manual Cinema, she had no idea that not only would her piece be selected- it would be randomly assigned to the Theater where her twin sister, Dinah Miller, works as the Technical Coordinator. We sat down with Julia to learn more about her piece, Lula Del Ray, and about their journey to NYC and the 14th Street Y this summer. 14th Street Y: Tell us about Manual Cinema- what gave you the idea to start it? Julia: I did a shadow puppet version of Swan Lake with the Chicago Symphony Orchestra and Redmoon Theatre in Chicago. 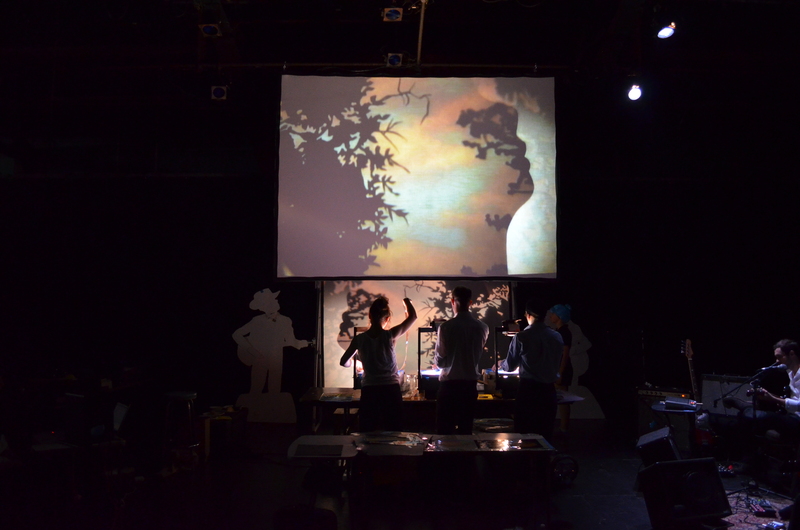 We used two overhead projectors and paper puppets to tell an adaptation of the story. I liked the medium so much I wanted to try making my own show so I got some friends together and made The Ballad of Lula del Ray. We liked working together so much we decided to form a company. 14th Street Y: We hear you have a personal connection to the 14th Street Y- tell us about it! Julia: My twin sister Dinah is the technical coordinator for the Theatre. Being all the way from Chicago and a pretty big tech heavy show we were so thrilled to have a person so familiar with the space and familiar with our work. We don’t think it would have worked out so well without Dinah’s help. It made coming to New York with our show seem way less daunting. 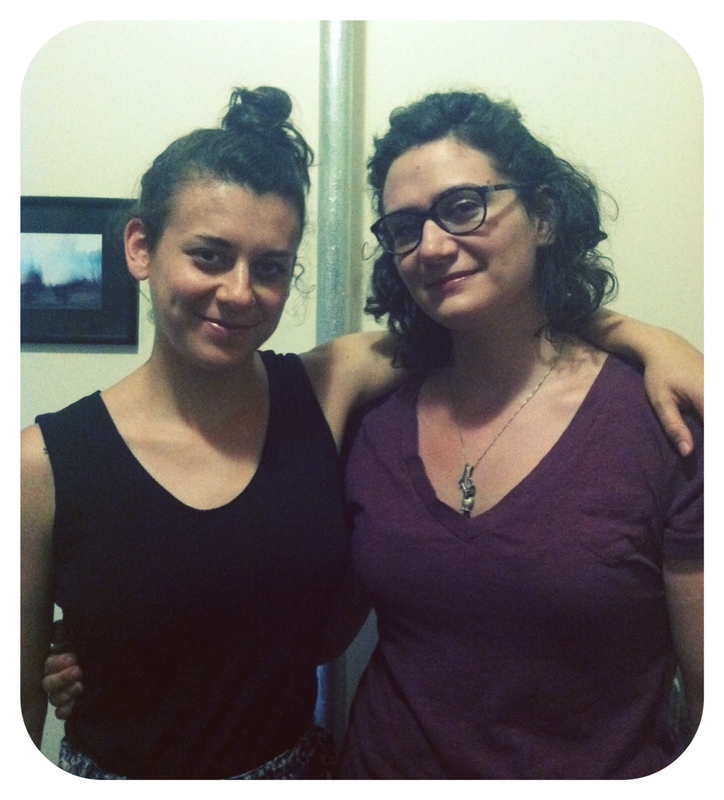 14th Street Y: What is it like to be part of the Fringe Festival? Julia: The Fringe Festival is a pretty crazy event. There are 12 shows alone sharing the theater at the Y so scheduling is pretty tight. That means set up and strike need to happen very quickly. We actually had to rehearse setting up and striking our show in 15 minutes so we could be prepared for Fringe. 14th Street Y: Tell us a little about Lula del Ray- how is it different than other Fringe shows? Julia: Lula del Ray is a feature length cinematic shadow puppet show performed with overhead projectors, shadow puppets, actors in silhouette, and live music. Told almost entirely sans dialogue, experiencing Lula del Ray is like watching an animated film that is being made by hand right in front of you. The 14th Street Y welcomes FringeJr to our Theater! 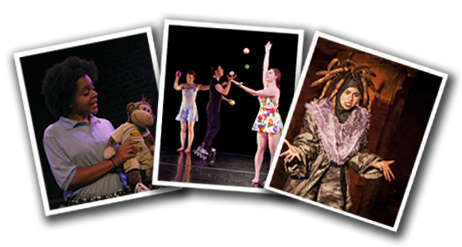 The New York International Fringe Festival, the parent of FringeJR, is the largest multi-arts festival in North America! In the span of 16 days, 200 companies will give 1200 performances in 20 venues. FringeJR, the festival for families with children age 5 to 12, is being performed exclusively at the Theater at the 14th Street Y! Y Families are especially invited to 3 FREE Fort FringeJR events. These events are a great opportunity for your little ones to meet characters from the plays, play games, make crafts, and (it goes without saying!) have an AWESOME time. Sarazad and the Monster King will host its Fort FringeJR event at 4pm on Friday, August 9th at the 14th Street Y (fitness studio). This play by the TRUF Company’ is a story about a young girl who uses the power of storytelling to overcome schoolyard bullies. Peter Pan and the Stardust Dances will host their Fort FringeJR event at 2:30pm on Sunday, August 11th at the 14th Street Y (fitness studio). Presented by Eva Dean Dance Company, this show is a series of highly creative and imaginative dances set to original music. The Young Olympians and the Most Amazingly Awesome Adventure Ever! will host their Fort FringeJR event at 12pm on Sunday, August 18th at FringeCENTRAL (27 2nd Ave). Maryland Ensemble Theatre’s musical adventure is about a quest undertaken by your favorite Greek heroes (when they were teenagers). To give you a sense of what these shows are truly made of, FringeJr Director Gus Jacobson sat down with members of The TRUF Company to talk about their FringeJR show Sarazad and the Monster-King. Gus: Can you tell me a bit about what making theatre for children means to The TRUF Company? TRUF: Kids and grown-ups aren’t all that different. At least that’s what we at The TRUF believe. Whether you’re five or 45, you feel the same feelings as the other…you just don’t always talk about it together. But ask the next tiny human you see to describe what it feels like to sit in a dark, empty room, or what it feels like sit next to an unopened birthday present, and you’ll see that they understand isolation or hope just as well as you do. With this philosophy in mind, The TRUF sets out to create theater that speaks to young and old and gets them talking to each other. Our productions come in pairs, a children’s show for every adult show, both of which revolve around the same theme. So whether you’re a grown-up watching Shakespearean prose or a kid watching a dancing monkey, you’re both feeling the same feelings. Then you talk about it. Gus: What a great point –talking about theater is crucial! So, how did Sarazad and the Monster King first get created? TRUF: Sarazad & The Monster-King was originally commissioned by The TRUF to be paired with our grown-up show (Someone Who’ll Watch Over Me by Frank McGuinness) in the Summer of 2012. A re-imagining of the “Scheherezade, or the 1001 Arabian Nights,” Sarazad & the Monster-King focuses on storytelling and how we use our imagination and dreams to sometimes escape the hardships of our realities. Sarazad is a nine-year-old dreamer who loves to use her imagination to share stories with her best friend, a stuffed monkey. Unfortunately, the other kids at school don’t appreciate her creativity and instead tease her for being different. Sarazad escapes by retreating into her dreams where she comes face to face with a Monster-King who wants nothing more than to make her his dinner. SPOILER ALERT! Only Sarazad’s never-ending stories keep her out of the stew pot until the Monster-King ultimately learns the power of friendship. With her newfound confidence, Sarazad returns to the playground to defeat her playground “monsters” and lives happily ever after! Gus: What a great story! Now I really can’t wait! For my final question, could you tell us what it has been like to be a part of FringeJR and the Fringe Festival so far? TRUF: (Good!) theater that caters to families and children is an art, and not always as promoted or respected as we wish it was. The fact that as esteemed an institution as FringeNYC has put their weight behind creating quality children’s theater speaks volumes. They may be little, but kids (and the grown-ups in their lives) deserve to see greatness on stage. The TRUF is here to deliver! We ADORE Sarazad & the Monster-King, and could not be happier for the opportunity that FringeJR has given us to produce it again. Just like so many New Yorkers, The TRUF faced our own bully when Hurricane Sandy hit the city last November, and we were forced to literally close our theater doors and put a pause on our season plans. FringeJR has breathed new life into our young company, and given us the chance to share what we do best with even more audiences. We thank you for being a part of the adventure! And an adventure it will be when Sarazad and the Monster King kicks off the 2013 FringeJR season TOMORROW! We hope you will join us on Friday, August 9th as we kick off the Festival with a FREE Fort FringeJr event with Sarazad at 4pm in the fitness center, followed by the opening performance of Sarazod and the Monster King at 5pm in the Theater at the 14th Street Y. Tickets are on-sale NOW! They can be bought in advance or at the door. For more information, and a full performance schedule please feel free to visit the FringeJR website by clicking here. With the launch of our successful composting drop off program last March, the 14th Street Y has discovered how willing people are to participate in composting when given the opportunity to do so. Composting is a great eco educational tool for kids, and it’s never had more room to shine than right now, at our New Country Day Camp. Today we’re sharing a blog written by Aneta, New Country’s very own Greening Coordinator! . Kids learn about composting at New Country Day Camp! We are very excited to introduce to you our Composting and Gardening program at New Country Day Camp in summer 2013 where campers and staff have been busy playing, smiling, and composting! Our environmental program exposed 600+ children, from ages 4-12, and 100+ staff to the environmental advantages of composting and Jewish values that are associated with environmental advocacy. The program consisted of a diverse exposure not only to composting, but to gardening, environmental interconnectedness and our responsibility as members and leaders in this world. 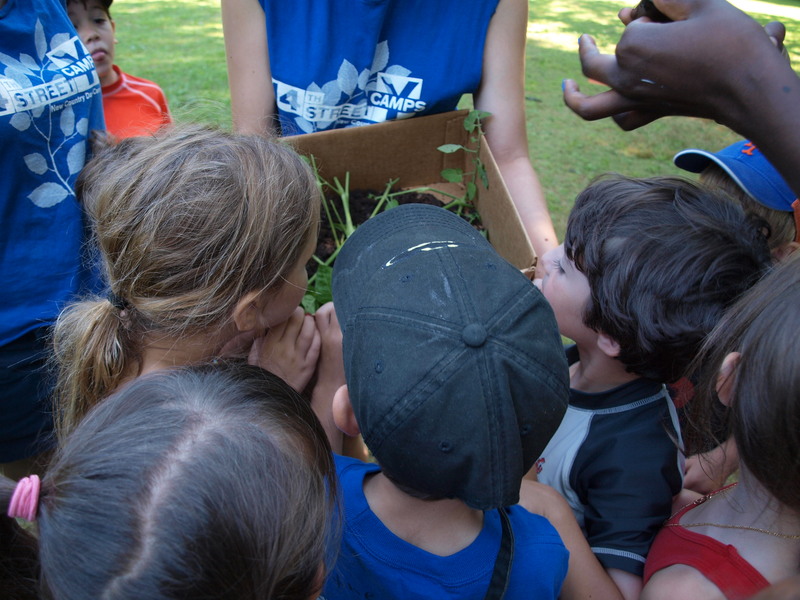 Campers were introduced to our worm bins, our metal can compost bins, our sensory/Havdalah garden and lead through activities on the "what, how and why" of compost. Our sensory garden featured plants that stimulated different senses: basil and stevia for taste, spearmint, peppermint and English lavender for smell, sunflowers for sight, dusty miller and lemongrass for touch and echinacea for sound because of its attraction to songbirds. It was also entitled a Havdalah garden because it reminds children of the ceremony we have after Shabbat, in which we use our senses to taste the wine, smell the herbs and see the candle. At lunch, and after every Sustainable snack, children were reminded to throw their food scraps into our green composting bins filled with our compostable bio-bags. A "Yay or Nay" sign supplemented the reminder by showing children what could be (hence the yay!) and what could not be (nay) composted. Every Wednesday and Friday, the bio-bags were collected and brought onto the Manhattan buses to be brought back to the Y, where it was compiled with the Y's compost. This acted as a zero-carbon footprint method because our children were already traveling on the buses back and forth from camp and the net worth of our compost collection was greater because of the variety of items the Y accepted for composting. On average, NCDC diverted about 130 pounds of food scraps away from landfills and into nutritious soil a week. At the end of Week 5, NCDC has composted 685 pounds of compost and is expected to produce over a thousand pounds in one camp season! That's a whole lot of soil that then is used for local farms upstate. As for programming, campers how to create seed globes, which are small balls of organic compost, water, red art clay and seeds that act as micro-environments for plants to grow almost anywhere, and exposed campers to Jewish values such as Bal Taschit (avoiding waste), L'avdah u'leshamrah (protecting the environment), Manhigut (leadership) and Arevut (mutual responsibility). We illustrated the values of composting by creating educational and experiential opportunities for the campers to engage in throughout the day in their age and subject based units. As Greening Coordinator, I designed programming that intertwined environmental education along with each unit. For example, we set up our compost bins, built our sensory/Havdalah garden and made mint lemonade from our garden with CCP, our Cooking, Camping and Pioneering Unit. With Gymnastics, we discussed the importance of a closed cycle and brainstormed other cycles that exist in our lives, such as the cycles of the moon and sun, the planets, and the life cycles of plants and animals. We manifested these ideas through body movements in a show during Shabbat. For Arts and Crafts, we built recycled scarecrows for our garden made out of toilet paper rolls, milk jugs and old clothing. With Science and Technology, we did soil testing, used this information to decide upon the location for next year's planter box and planted sunflowers as an activity for teaching phytoremediation. For Performing Arts, we created stop-motion films that both promoted and educated composting and environmental work to campers and you! the parents. 1. A worm bin is a great way to do indoor composting. Worm bins can be purchased through the Lower East Side Ecology Center: http://www.lesecologycenter.org/index.php/composting.html. They even have a compost hotline! 2. Outdoor compost bins are also an option for any outdoor space. 3. GreenMarkets accept compost collections, and other forms of recycling such as textile recycling, from homes at varying times and locations in NYC: http://www.grownyc.org/greenmarket/ourmarkets. An excellent way to keep food scraps in your home in between visits is to freeze your compost! 4. Last but not least, the Y is happy to accept any and all of your compost. Click here to learn about the Y’s Composting Program! Join our campers in our composting efforts and keep on composting! Aneta Bujno, our Greening Coordinator, has worked at NCDC for five summers. Aneta learned how to teach environmental education by volunteering at Bushwick City Farm, a grassroots community organization in Bushwick, Brooklyn.